Do you want to become a better writer? A better organizer? A better collaborator? In that case, try using mind maps. Creator Tony Buzan called mind maps a ‘genius tool’. Why? Because mind mapping can fire up your brain and boost creativity. 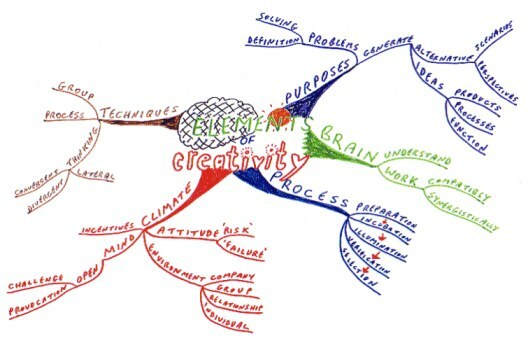 A mind map is a thinking tool that reflects what goes on in the brain. When two bits of information intersect, an idea is formed. Then the idea triggers radiant thinking. This means that the brain makes countless associations, radiating in all directions. There is a trick to kick-starting your creativity by mind-mapping. Take time to doodle! Decorating your map allows your brain to go into free-flow mode. Then it can come up with unexpected connections. Buzan iMindmap3 is still largely focused on imitating hand-drawn maps and on boosting creativity. You can download a free trial version here http://www.imindmap.com/. Price: iMindMap Elements $99, iMIndMap Pro $199. Check out the interesting articles on the iMindmap site. Freemind was one of the first mind map software programs. It’s free but not user-friendly and lacks good tutorials. PersonalBrain4 basic is free; PersonalBrain Core costs $149.95. Mind Manager is one of the older programs. It’s an expensive option at $349.00 and doesn’t seem to offer as much information and training as PersonalBrain. XMind is a open-source program. The basic version (which is elegant and easy to use) is free. XMInd PRO costs $49.00 per year. I use the basic version in order to import and save my online maps. In the last few years, quite a few online mind mapping systems have sprung up. They can be used for storing and delivering information, as well as for collaborating on projects. Online maps look set to supersede desktop programs. The great advantage of online maps over desktop applications is that some enable real-time collaboration. Personally, I use online maps for all my projects. Using MindMeister – an online application that allows real-time collaboration – together with Skype, I can meet up with partners on the other side of the world and work with them as if sitting side by side at a virtual desk. At meetings, each point of the discussion can be recorded directly on the map, and I can track changes to the map that associates make. A mind map is a great way to keep track of a project. It allows you to get a mental screenshot of where the project is at. As a project slowly matures, all completed files can be attached to the map. Complex projects always have many different lines of development to follow. A mind map can hold all of these different streams at one glance. For example, if you wanted to start a new blog, you would need to keep track of creating a brand, designing a logo, choosing a platform, creating content, designing a website, setting and launching the blog, and so on. A mind map can hold all these different planning streams. A mind map is a great tool for studying. I find that I retain information much better if I organize it in a mind map. For capturing complex information it’s essential to have the option of attaching files to a mind map. I tend to attach notes, text -, audio -, and video files, as well as URLs to my mind maps, in order to keep all information in one place. I can then easily share the information with others. Can a map be restructured? MindMeister is a user-friendly program developed by a German team that offers privacy, real-time collaboration and attachment of files. (User license costs $49 per year ). Mindomo is a user-friendly program that has no real-time collaboration. In the free basic version maps are public and files cannot be attached. The Premium version costs $72 per year and offers privacy and attachment of files. Mind42 is a free program. It’s not as user-friendly as Mindomo or MindMeister. However, it offers real-time collaboration, but no privacy or attachment of files. Comapping has a strange feature: it anchors the center of the mind map to the left of the page. It has no real-time collaboration and attachment of files. Cost: $25 per year. We are going to give a way a FREE 3-month subscription to MindMeister to the first 10 subscribers to our brand-new monthly newsletter! Sign up fast! I signed up on Dec. 1, got a some sort of thanks/confirmation type message, but no email follow up on the MindMieister subscription. What happened? While it makes a some good points, this article is a bit disappointing (and should have been better researched), most especially the “five main mind mapping desktop applications” (only 2 listed fit the title, you forgot industry leader OpenMind from Matchware), not to mention the “our best-known online applications” (again, only 2 listed fit the title, you forget one of the first-to-the-table, bubbl.us). For people who want a real low-down on mindmapping and mindmapping software, the best place to visit is Chuck Frey’s Mindmapping Software Blog – http://mindmappingsoftwareblog.com/ – I don’t work for him and I’m not related to him, but in the wider mindmapping community, he’s considered to be a thought-leader on the subject of software. His software reviews, reports and surveys are legendary. I’ve just started using XMind after reading your post. I must say that it is more useful and convenient than my former Freemind. I just use Xmind to manage what I should write in long term (from what to what), and use hand drawing when write a specific post. It is handier than using software for that. Ok, that’s good information about XMind. Seems interesting. Can you explain that a bit more? Thanks for your tip about Inspiration! Yes, now I get how to work with PersonalBrain. You may find that mind maps grow on you, the more you use them. I’m a fan of Mind Maps. I’ve used them for several scenarios, from presenting vision/scopes to helping brainstorm on distributed teams. I think they’re also a great tool for paring up and brain dumping with a partner on a problem topic or to hand off knowledge as a mentor. I find a good pattern is to use the Mind Maps to frame out the space and name it, then drill into the space with more detailed documents..
Great article! XMind also offers the online to let users upload and share mind maps online. Paid users can even do private share. So I think it should be possible to list XMind under category of online cooperation. Cool tip. I use Mind Maps occasionally and usually get good results. Maybe I’ll try them more often. The fact that the node appears at the center of a new map is one useful feature of PersonalBrain. That way, you can see all the relevant informations about this “thought”. By clicking on the “+” button in the toolbar under the dropdown menu, you can an expanded view with more distant thought. To go back to your previous active thought, one easy way is to click on the thought in the bottom right of the plex (the display). There you find an history of the old thoughts you’ve activated. And you can go back to more older thought by clicking on the blue triangle next to the search button on the left of this history. It took me some time to get used to PersonalBrain, and I still learn something new each time I visit the forum. But after one year of use, it’s worth it! I own the Pro version but even the free version seems to be great. You forgot Inspiration. I have v.8 and it’s a great program. PersonalBrain is an awesome program, I agree! It’s beautiful and useful at the same time. My problem is that when I click on a node, it then appears as the centre of a new map. That’s cute and looks nice but I can’t always find my way back to the original map. In other words, I find zooming in easy in PersonalBrain, but zooming out difficult. Laurent, am I not using the program correctly, or is this really a limitation? What do you think? I use ConceptDraw MindMap for making notes/storing information for a book I’m writing (I’m using LiquidStory Binder for the writing itself, another good app.). I’ve found it really useful and you can ‘tag’ topics to help organise them, and sort them by title or % complete (if they are a task). I’ve used MindJet, that was good too, but ConceptDraw MindMap was cheaper at the time. So, I have no idea why the sign-up wasn’t working for you. From my point of view, PersonalBrain is far more than a MindMapping software. I’m using it as a knowledge and documents management software with excellent results. It can also keep track of any digital information: directories, files or web pages. And it’s Instant Activate search engine allow you to find what you’re looking for in seconds. In PersonalBrain, you’re not limited to hierachy links like in MindMapping but you can also create relationship links. And it works like your brain, with each active “thought” placed in the center of the display in its own context. Some sort of MindMapping with a third dimension. I really think it’s worth a try. PS: Sorry for the long comment but, well, I’m fond of PersonalBrain ! I’ve been using freemind for quite a while now and while it may not be the most user-friendly of solutions, it definitely does the job for me. I think there’s a problem. “Subscribe Here:” is followed by nothing. Just to make sure it wasn’t me, I allowed all scripts for the page. Still nothing. I’d love to subscribe to a monthly newsletter, as well as use great mind mapping tools. How do I sign up please? I agree: mind maps rock for studying. I’m doing a course at the moment called “Teaching Sells” which has a huge number of text and audio files. For a while I collected it in a folder on my desktop. But it’s hard to get an overview that way. Now I’ve structured it all in a big mindmap: great! Your idea of taking notes with the help of a mind map is really good. Next time I listen to an educational audio, I’ll use a mind map too! I must make a mental notes to get more fat, colored pens! Thanks for the info about Cayra. I had a look at the website and it looks delicious! Unfortunately I’m a Mac girl and Cayra is a Windows program. thanks for that interesting take on pre-writing techniques. Maybe I could prevail on you to write an article about that for us here at WTD? I used something similar this semester in a history class I took this semester called Scientific Revolutions of the 17th Century. It looked crazy, but it was SO effective in linking ideas from different parts of the lectures. If I’d had bigger paper, I’d have used it for the topics that spanned several lectures – as it was, I just used different sheets of paper. A regular 8 1/2″ x 11″ sheet of paper was just the right size for a 50 minute lecture. I’m checking out some of these online programs; I love having my computer in class! Simply put, prewriting is the stage of the writing process where you think about what you’re going to write. Most people, if they’re doing a serious writing project, will at least do a little research before they put pen to paper. But that’s just one aspect of it. By doing prewriting exercises, you can discover new angles to your topic, new questions to be answered, objections to be met, etc. Pay no mind to its middle-school focus: They are solid techniques that can help anyone write a better piece. Could you please let us know what you mean by ‘prewriting’? I just wrote about mindmapping with FreeMind a week ago! Great minds think alike, huh? Essentially, I come down on the extreme other side of the fence: I love FreeMind. Considering I used to do mind maps with a pencil and paper, I don’t need more than it offers. I only need two keys to accomplish everything I need. And to all the other writers who might see this: please prewrite! Mindmapping is one great exercise, but there are others. No matter how you do it, it will make your writing better. Thanks for the heads-up about bubble.us! You’re right – it’s very intuitive and fun to use. I like your high-tech map 🙂 My one quibble is that i like keeping my mind maps. I’ve struggled with FreeMind in the past. That was when there really wasn’t anything else. But I wouldn’t bother with it now. A program like Xmind is so much more user-friendly. I agree – bullet lists just don’t seem to get my thoughts flowing. $10 sheet of dry-erase board from Lowe’s or some other home store. At Lowe’s they gave me two cuts free with the purchase. So I had the cut it once in half, then one of the halves in half. Result was one four by four foot dry erase board and two four by two foot boards. Drop another $5 on dry erase markers and you’re good to go. AND it’s eco-friendly ’cause when you’re done you can erase and do it again later. Mary, Nice article. I just recently started writing articles and blogging for Mindjet and mapping is obviously essential to my process of planning and writing blogs. I’m curious, what information assets would you like to see to better articulate how MindManager can help writers and others as they produce their work? Thanks and I look forward to future posts. My favorite mind mapping software is http://bubbl.us/edit.php. It’s simple, elegant, and intuitive. Of course, paper and pen(cil) is always the simplest way to go. I like to use a mind mapping to organize my thoughts into a rough outline, since I think that it’s a better tool for fleshing out ideas than traditional bulleted lists are.